This speaker hangs with the best in terms of sound, and the retro design is fun to look at—and to use. When companies such as Fender branch out into product categories they’re not known for, it always invokes an element of skepticism in the press. Guitars? Amplifiers? All cool, Fender. 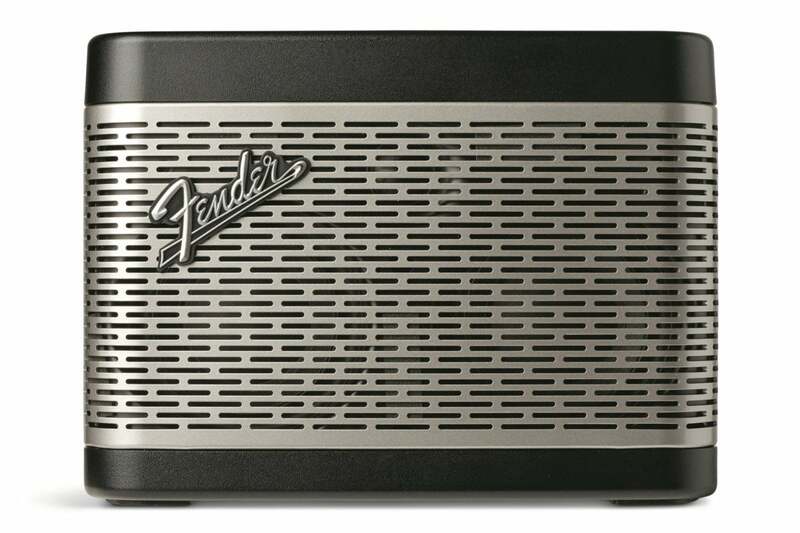 A Bluetooth speaker that echoes the look of a Fender guitar amp? Prove it. Fender has. The Newport is one of the best-sounding single-cabinet Bluetooth speakers of its size on the market, totally justifying its $200 price tag. If you didn’t catch it in the intro, the Newport is designed in the style of a portable Fender amp, like the famous Princeton, Reverb, or Twin. It’s convincing without being stupid; real fabric speaker grills aren’t very practical for carry-along speakers, so the company opts for real metal. Take that pokey things. Real, high-quality analog controls and switches. Yes. But the coolest part of the design is the fully functional, retro Fender-style control knobs/potentiometers on top of the unit. They control the volume, treble, and bass, and they feel super solid and smooth. Appreciation for the superior tactile and visual feedback afforded by old-school analog controls is rare in a world that’s enamored with touchscreens. Note that the treble and bass are actually boosts, adding emphasis to the high or very low frequencies; they're not boost-cut types like on a real guitar amp. There’s also a genuine toggle-type power switch, a properly Fender-like power LED (not old-school jewel-shaped red, but the flat modern blue, unfortunately), Bluetooth pair, and Talk (for phone calls) buttons. The Newport is sturdily constructed, as is evidenced but its 3.25-pound curb weight, although some of that is undoubtedly due to the large battery inside. The speaker measures 5.6-inches high, by 3.5-inches deep, by 7.25-inches wide, which makes it a bit more cumbersome that most, albeit still perfectly portable. 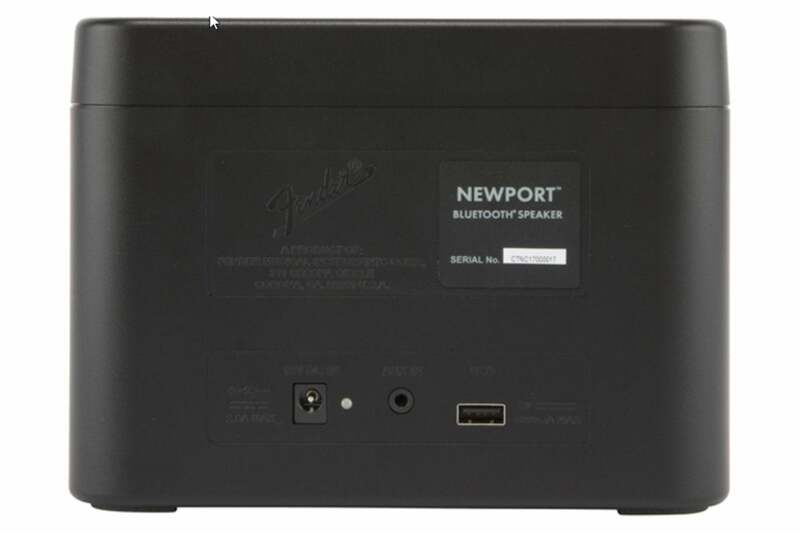 On the back of the Newport are an 3.5mm auxiliary input, AC power jack (not USB) with a charging indicator LED, plus a USB Type A port for charging other devices from the speaker’s battery. The power jack and AC adapter are a slightly oddball 15-volts. That will charge the unit much faster than a 5-volt USB style hookup, but of course it’s not as common as the micro-USB connector that most BT speakers use. Try not to lose it, it won’t be easy to replace. The only thing we don’t like about the Newport is that it uses a less-common 15-volt AC adapter. 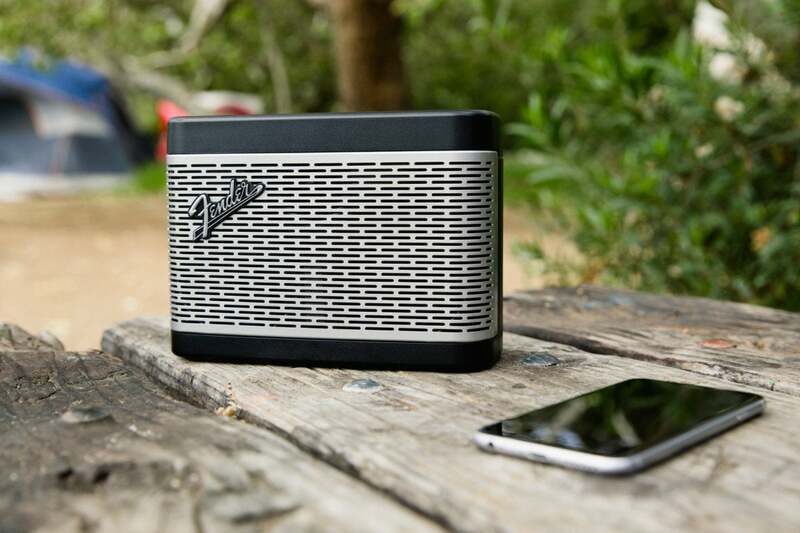 There’s also an onboard mic for phone calls, and Fender bundles both a 3.5mm stereo (aux input) cable and a micro-USB charging cable (USB Type A on the other end) to ward off surprise trips back to the store. How does the Fender Newport sound? As the Newport is a speaker, the real buying criteria is the sound it outputs. The minute you hear the guitar strum that accompanies power up, you get the idea that the 30-watt Newport’s emanations might be on the plus side of pleasant. The Newport has a relatively neutral sound; that is, it doesn’t overly accentuate any frequency. 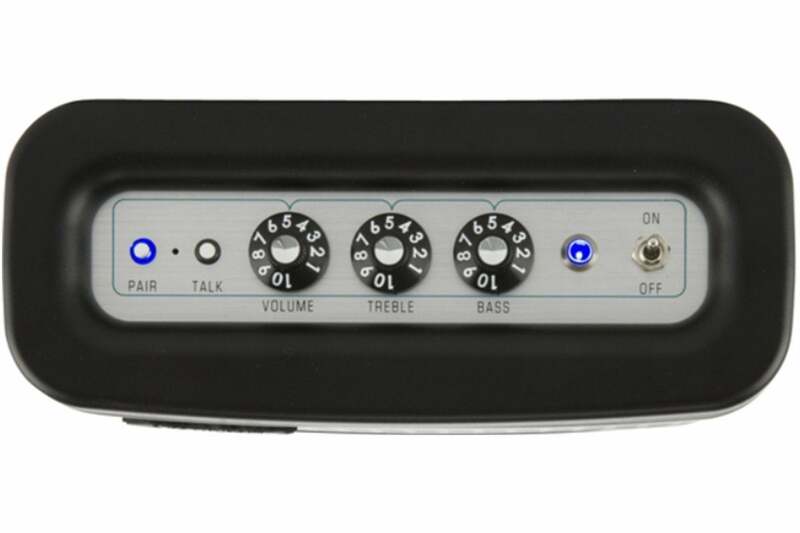 It has enough top-end to keep things clear, the mid-range is decently tight, and turning the bass up to 10 provides more than adequate thump for most music genres. If you’re looking to loosen the bolts in your vehicle, this won’t do it like a sub-woofer, but it’s not a wimp. What impresses the most is how clean the Newport’s sound remains even when you crank the volume, of which there is a fair amount. Very few Bluetooth speakers don’t distort in one way or another, or start to accent different frequencies as you turn them up. The Newport stays undistorted and retains the same sonic coloring throughout the volume curve. If there’s any complaint at all, it’s the lack of stereo separation that is present with nearly all single-cabinet Bluetooth speakers. The Newport is probably a hair worse than most units in that regard, because—well, it’s not stereo. So as not to prejudice you, that fact is introduced at the end. The overall sound is so good, a good deal of listening took place before the realization that it isn’t stereo kicked in. Okay, it’s not stereo, but the Newport sounds a lot better than many of its stereo competitors. That says something right there. Mostly how lousy the separation is with most Bluetooth speakers. What was a bit disappointing was the lack of support for TWS (True Wireless Stereo) or the equivalent. A pair of these in a stereo configuration would probably sound very good. Fender claims up to 12 hours of run time for the Newport, and that’s just about how long it ran at low volume. Standby was three days and counting at the time of this writing. Before I dragged the Newport out of the box, I’d prepped mentally for disappointment. Instead, I got a high-quality Bluetooth speaker that rewarded my sense of nostalgia rather than punishing me for it. For everyone who finds all my retro-babble completely irrelevant, the Newport is a very good Bluetooth speaker. Yes, it’s expensive, but it’s also well-built and sonorous, with tactilely satisfying analog controls. Sweat the price, but don’t sweat the absence of stereo—I never missed it.